Today I found a new coffee business resource TheCoffeeBoys.com … after watching several of their videos and agreeing with the information they are providing, I felt compelled to also share their insights with you. I was especially impressed with the video Three Ideas for Increasing Your Gross Profit and think it’s a “must view” for coffee shop owners (although the webinar referenced is long over). They’ve also written a few books and although I’ve not read them (yet), I can safely assume they’d be full of good information based on the video content on their blog. You can click the image of the book cover to be taken to their Amazon location for it. 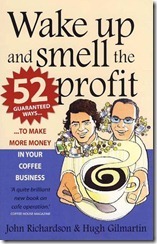 What are your favorite coffee business resources?